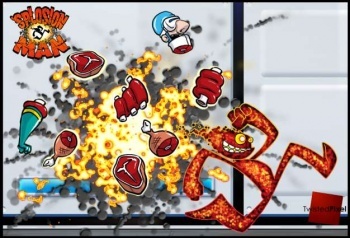 In Twisted Pixel's new game, 'Splosion Man, you 'splode things. When they 'splode, they turn into steaks. Twisted Pixel is all about simple concepts embodied by simple characters. In their last game, The Maw, the titular character had a big mouth, and it ate things. In their newest title, 'Splosion Man, there's a man made of pure explosive energy, and he explodes things. I mean, they could have made a game about sad dudes who just broke up with their girlfriends traveling back in time only to find themselves in a failed utopia founded on the principles of some nutjob 20th century philosopher, but no. "Screw that," Twisted Pixel said. "Let's just make a game where stuff blows up." Sounds good to me. 'Splosion Man, who was created from "plasma and flame in an underground military lab," doesn't just deal in your everyday Michael Bay explosion, though. He can explode at will, sending himself rocketing across the game's 2D levels, and whenever he touches anything, it 'splodes. When he catches one of the scientists trying to stop him, though, that's when things get delicious. "Any scientist he catches is 'sploded into chunks of ham and ribeyes, the smell of their destruction terrifying, but also a little succulent," Twisted Pixel said. 'Splosion Man will also feature four-player co-op that comes in online and local varieties, as well as online leaderboards. Twisted Pixel says that it will be released on Xbox Live Arcade "shortly before the world is incinerated."